1 bedroom luxury apartment, it is fully air-conditioned with ceiling fans and is equipped with all you would need to enjoy your holiday. 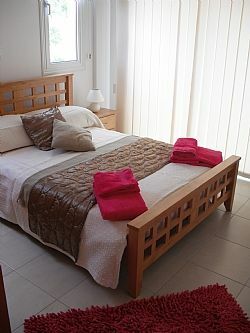 The apartment is on a small complex with communal swimming pool, patio area and poolside showers. The apartment has a private roof terrace with impressive views of the sea and surrounding countryside enabling you to enjoy the wonderful sunsets. Tala village is a 1 minute drive/5 minute walk and enjoys a very good selection of restaurants and tavernas, frequented by the friendly local villagers and holidaymakers alike. I was in the army and Cyprus was one of my enjoyable destinations. I now work as a highways engineer for a local authority. Lin is a retired BT employee who has also worked as an administrator in a care home. We fell in love with Cyprus and the people of Cyprus. we fell in love with Cyprus and the Cypriot people, Tala is a wonderful village which offers the best of Cyprus. It's not too far away from the hustle and bustle of Paphos, ideal. Fully tiled bathroom, bath with shower, separate wet room style walk in shower, toilet and sink. Lounge dining area, sofa bed, two seat sofa, and TV/DVD . Fully equipped kitchen with breakfast bar, oven and hob, microwave, kettle, toaster, fridge /freezer, washing machine, iron, clothes airier and full inventory of cutlery and crockery for four. If golf is your game you will be in for a real treat. A 10 minute drive from the apartment there is the Minthis Hills Golf Club, this testing 18 hole course is set in the grounds of 12th century monastery. 30 minutes away are the courses of Aphrodite’s Hills and Secret Valley, both 18 holes, both stunning. 20 minutes away is the Sir Nick Faldo designed course of Elea, even if you don’t play this course its worth a trip out for a drink at the 19th. If this isn’t enough you can hit a bucket of balls at the new driving range, which is a 5 minute drive away on the Paphos coral bay road. Notes on accommodation: This luxury first floor apartment is fully air conditioned and is fitted with ceiling fans for the hotter months, it is equipped with all you need to have a wonderful holiday. The 26 apartment complex is a 5 minute walk from the traditional Cypriot village square of Tala or a 10 minute drive from the blue flag beach of Coral bay or Paphos town /harbour. The apartment has Wi Fi and TV Outside: This small complex has a shared pool, with separate male/female showers and toilets. Also as part of the pool scene there are sun loungers, tables and parasols. Cleaning / Towels / Linen / Maid service: Linen and towels provided. Mid stay cleaning and linen change can be arranged for a nominal fee. Other: Spacious private roof terrace, patio furniture and barbecue. Ideal for sunbathing or outdoor dining and of course watching the beautiful sunsets. This apartment was ideal for our visit to Paphos, not too far away from all the amenities, it had all we needed for our holiday. Very clean, superb service from the agent. best of all we didn't have far to walk if we fancied a night out either eating or at the local watering hole, Marios. I come to Tala every year normally with family because it is a beautiful place with lovely people. This year I came back again on my own for two weeks at the beginning of October and stayed in this apartment. It was ideal for me and was very clean and had everything I needed. Collette and Mark were very helpful with any problems or queries I had and got me the supplies I needed for when I arrived. The apartment is about a 10 minute walk from a salon, pharmacy and supermarket and bus stop. It is also a short drive away from a couple of beaches and a tourist stretch. It is just a 5 minute walk from the village square which has a few wonderful restaurants and of course the best bar ever, Marios, with a great atmosphere and brilliant people. There is a rooftop which is great for eating on and perfect to watch the stunning sunset at night. You are guaranteed to have a wonderful time in this place and meet many lovely people and make lots of new friends. I would definitely recommend this apartment to anyone. Tala, my favourite place to be, always. Thank you for making this holiday happen and opening doors for me which wouldn't have been opened had I not gone on this holiday. Just what we needed. A nice tidy apartment located in Talla which we used as a base for travelling to see the sights. We could eat and drink locally, within walking distance or drive to the many places on the coast. We sat on the balcony for breakfast and roof terrace to see the Sun go down with good company and some wine. For us it was an ideal stay and would recommend. Even before our stay in Tala we had a great communication with Ian and Lin. We received all important information before our arrival and also during the stay there was a great communication. The apartment is beautiful and very well furnished, the roof terrace is wonderful and also the neighborhood is super beautiful. Everything is clean and tidy and we felt very comfortable from the first day on. We are looking forward to visiting again. Thank you for your very positive review, so glad you enjoyed your stay at our apartment. The Paphos area boasts numerous beaches from the very secluded to the more popular and better known Coral bay. Further out from Paphos there is Lara beach and the turtle sanctuary, going north to Polis you get yet another experience and to the east of Paphos there are yet more stunning beaches and coves. Paphos International Airport is a 20 minute drive from the apartment, Larnaca airport is a 90 minute drive on the motorway from Paphos. It is strongly recommended to hire a car, car hire firms are very competitive and Cyprus drives on the left. Paphos is also well served by public transport. Paphos is a holiday destination to suit all tastes, from chilling out at the beach or pool to visiting the archaeological sites and monasteries. If it’s a walking holiday you want the routes are many and varied from coastal to mountain. For the more adventurous there is an activity for you, from scuba diving to jeep safaris. For the younger holidaymakers there are numerous activities and places to visit such as the water park, pony trekking, animal parks / sanctuaries and go kart racing. The night life also caters for all tastes. Booking Notes: Payment can be made by cheque or bank transfer. Minimum rental is for 1 week, additional days are charged pro rata. 30% booking deposit is required at booking the balance to paid 8 weeks prior to travel. A £150 security/breakage deposit is also required, this will be refunded providing there has been no damage to the apartments, fittings, furniture and decor, there have been no breakages, excessive use of the air-conditioning and additional cleaning is not required. Changeover Day: We can be flexible on change over days and times - this will be dependant on other bookings. Notes on prices: Prices are for the apartment per week in UK pounds. We will be happy to discuss discounts for long winter lets.